How to Sell & MAKE Money! Be sure to select the CONSIGNOR user group to sell your items, but also consider registering to VOLUNTEER - that way you add value to your sold items (10%), but you shop early, too. Start by gathering your items together and hanging them in size and gender order. Prep instructions & guidelines below. Create your own tags on our online tagging system, which is available 24/7. If you choose to donate all your items that don't sell, then you're done! If you want to pick up unsold items, PICK UP starts at 5p and ENDS at 8p, the Sun. after the sale ends. ...And your check shows up at your home! SIGN UP to get your FREE account to make up to 80% on your items. In your account, Click the Tagging tab, to use our free online tagging site, open 24/7. On your account, choose TULSA METRO FALL 2019. Then you need to choose CONSIGNOR. If you want to help, you will also choose VOLUNTEER. The schedule will automatically pop up showing all of the available shifts. When you help out this allows you to shop early and earn more! We have a $12.50 consignor fee, which we can take out of your check, no need to pay early. Let your friends know about the sale, and get them to consign at least 30 items and ask them to list you as their referer. Never created a profile/account with JBF. Tag their own items. They cannot be a part of our VIP Tagging program. Drop Off (Wed., Thurs., or Fri.) NOTE: Any referrals who drop off during our 2nd drop off only on Sun., will not count toward our referral program. Use our prep links below for complete instructions on how to gather, package and tag your items. It's JBF policy not to accept items that are not prepared following these guidelines. Our handy Pricing Guide below can help you price your items. The basic pricing guideline to follow is to price your items 1/3 of retail pricing. Consignor Presale - Sat, Sept 7th starts at 1p.m. Checks are mailed 2 weeks after the sale! Check your day planners & get a sitter! WE NEED YOU! Volunteering/Bartering is so easy. When do you want to shop? The more you volunteer, the earlier you shop + earn 70%, too! Saturday, Sept 7th 9am to 10pm! First Time Moms at 6pm (can bring 2 guests) Must register by clicking here. PLEASE NOTE: FOR THE SAFETY OF ALL, CHILDREN ARE NOT ALLOWED AT PRESALES OR DURING YOUR SHIFT TIMES. Please bring your children’s sizes with you. Special Note: Consignor Family Presale shop is at 5pm, when consignors children can attend with their family. ~You shop at 9am, Sat, Sept 7th & Half-Price Presale 7:30 pm, Fri, Sept 15th. LOGIN and then choose VOLUNTEER to be able to see what barter is available. If you have chosen a MEAL BARTER: Look here for each days meal with receipes to find yours. All barterers must email Shelly@jbfsale.com to get your complete instructions. To shop the volunteer presales, pick up your presale pass at the Volunteer Information Table during our consignor drop off times. If you can not pick up your presale pass during our consignor drop off then you will need to arrive at least 15 minutes before your shop early time and go to the south door to see the volunteer with the passes. Only one person per pass - no husbands, mothers, children, pregnant friends, etc. will be permitted to attend the volunteer presale without a separate pass. If you need to come back to shop with your children, you may do so at 5:00pm. When you get to the sale to volunteer, please enter through the doors on the east side of the buidling. We will meet you at our Volunteer Sign In Table just outside our Office Area. Please remember that you need to be comfortable. We recommend wearing close-toed shoes that give you lots of support. And please wear clothing that lets you move easily. We also have aprons that you can use to keep supplies in. Snacks will be available, but if you have special dietery needs, you may want to bring a private stash. We will have lots and lots of ice cold drinks! Please arrive 15 minutes before your shift starts to be paired with a friend! If you have signed up to help during our drop off times, please plan to come an hour early or stay an hour late to drop off your own items. Your five hour shift will need to be spent helping other consignors. If we have a slow time, we will try and have inspectors bring their items in but can not guarantee anything. Do not leave valuables in your car or anything visable. You might want to lock your valuables in your trunk or just leave them at home. Consignors with +300 items, Perfect Consignors & 24 hour volunteers....Set up an early drop off appt. here. 3) Your correct email (we need an email you can get to for JBF updates). Once checked in you are welcome to use our racks to get the rest of your items in the room. then stop at our check out tables to finalize your pick up. If you do not have your Pick Up Pass, you will need ID to pick up items.If someone other than you, the original consignor will be picking up your unsold merchandise they must have your Pick Up Pass. Any items not picked up (or left in the room) after 8:01pm will be donated to Emergency Infant Services & Catholic Charities. We are not able to take items home with us or have them in the rented room after this time. We are not able to allow racks to go outside during pick up to accomadate all consignors. Checks will be mailed 2 weeks after the sale! PRICING you set the price! Price your items as if you were buying them- keeping in mind the quality, name brand and condition of your items. JUST BETWEEN FRIENDS suggests starting at 1/3 of the original price. We also suggest that you let your clothing items be included in the 25% off and half price sales. $3.00 Rule if your single, hanging clothing item can't bring $3.00 on it's own, please pair it with something that will bring it to this amount. This only applies to clothing, not toys/equipment. JUST BETWEEN FRIENDS will be conducting strict inspection of your items. Unacceptable items will be returned to you or we can donate them for you. Attach safety pin side to side, horizontally on the card. Extra security feature: If you want to secure your tag on the clothing item to help prevent switching tags, simply place the pin horizontally on the card, then put a clear piece of tape over the pin. Please do not place tape over the actual bar-code as this makes the scan unreadable. Our cashiers and baggers do an excellent job of looking at the tags and double checking that they are selling the correct item to each shopper. If you would like to make an extra effort to ensure the selling of your items if they are lost, we suggest putting masking tape with your consignor number on the inside collar/or waistband of your more expensive clothing item or large items. This is optional. Enter our free online tagging site thru the Login. TIP: Can't print at home? Consider saving your tags as a PDF and email to a friend, relative or Office Depot to print on cardstock. Many library’s allow you to print too! Attach tags with safety pins: Please use size 1 or 2 safety pins; no straight pins or small gold ones. Remember all multi-piece clothing items must be safety pinned together through all pieces. This will prevent your items from separating. LOOSE ITEMS like infant boy/girl accessories, bows, headbands, socks, safety items, etc. can either be tagged securely a piece at a time or be grouped together in clear Ziploc bags with the tag attached to the outside of the bag. Use clear Packing tape for securing the bags closed. This prevents "little" hands from reaching in. When you are ready to tag your items, use the Login at the top right of this page to create an account or sign up to consign. 2. MAKE SURE YOU HAVE REGISTERED WITH THE TULSA SALE by choosing Tulsa Sale. 3. Choose to be a CONSIGNOR as your user group. Select TAGGING to begin tagging your own items. We have a HELP button with How To Videos for your help. 4. Track your sales online. NO CROSS OUTS OR WHITE OUTS OF ANY KIND ON TAGS. If you need to change any information on your tag is must be done by the EDIT feature and then printing off a new tag! You choose to PICK UP or DONATE your unsold items. If you wish to Donate your items at the end of the event, select "Donate" on your tagging PROFILE in Tagging button. A large letter D will appear on your tag and that item will be donated if it does not sell. You can choose if you pick up unsold items by leaving off the D for donate. We encourage donating your unsold items. It blesses so many people. In your tagging PROFILE you can choose full price or discount. A star on the tag indicates that you DO NOT want the item discounted. A star tells the customer that the item is full price. If you leave off the star, your item will be included in our 25% & 50% off sales. Please inspect your items carefully at home-we will also inspect them at drop off. Clothes that are soiled, stained or with holes, will not be accepted. Just Between Friends reserves the right to deny any unacceptable items. We will be accepting only Spring/Sumer items for our Feb/Mar Sale and only Fall/Winter items for our Aug Sale or all-season-school-uniforms for both sales...see below*. We accept Girls sizes preemie thru size 14. Sorry, we are no longer accepting Teens/Juniors clothing. Boys sizes preemie thru size 14. Sorry, we are no longer accepting men's sizes s,m,l,xl. No Adult clothing accepted except Maternity. All clothes must be hung and on appropriately sized hangers with the hook pointing to the left (Make a question mark with the hanger.) and the tag on the right shoulder if you are facing it We do not accept bagged clothing items, all clothing must be hung on a hanger. Accessories are fine in a Ziploc or with just the tag attached with a safety pin. Children's clothing sizes 4T and under must be on child size plastic or wire hangers (between 10-13 inches long). Clothing sized 5T and even 6 might still fit on child sized hangers but clothing sized 7 and above needs to be on adult sized plastic or wire hangers. Need hangers/safety pins? We sell them for your convenience. Find locations at the bottom of this page. Please do not attach your tag into clothing with a tagging gun, it could make a hole and ruin your clothing. We may consider taking light weight, very light colored long sleeved shirts/jackets/windbreakers depending on the theme. All other long sleeved shirts will be welcomed for the Fall/Winter sale. We will also be taking black/red/navy/hunter green short sleeved shirts depending on the theme. All other short sleeved shirts will need to be saved for the Spring sale. We will except these bottoms: jeans and capri that are cords, velvet, velour and other heavy weighted fabrics. We will also accept soccer & basketball shorts. We will located the shorts in the sports equipment table, we will have a rack just for these items. We will now be accepting any season school uniforms at each of our two annual events. All uniforms will be hung in their correct size range. Because of the size of our sale, we are not able to seperate out uniforms from all other clothing. Only 1 tag per hanging item. If you have a clothing set on a hanger, it needs only one tag and one hanger. You will Pin clothing sets securely together with pants hung on the backside of the shirt and pinned at the waist on the hanger. Both pieces can be viewed without unpinning them. Pants hung on a separate hanger tend to come off the hanger and then get separated from the top. Again, we try to keep a reputation of being the best! Please help us attain that goal! Sorry, but we do not sell Junior sized clothing at the Tulsa JBF sale. Girls sizes preemie thru size 14. Boys sizes preemie thru size 14. Sorry, no mens sizes. No Adult clothing accepted except maternity in the following brands: Pea in a Pod, Gap Maternity, MiMi and Motherhood. Please sew loose hems and make sure zippers, buttons and snaps work properly. For Fall only: We can only accept name brand Sweat shirts: Nike, OSU, OU, Old Navy, Gap, etc. .
Sleepers/Onesies (these are the cheap little bodysuits/undershirts that can be purchased at the stores in packs of 3 to 6)-limit of 10 per consignor. Pin several together and sell as one set and it only counts as one item. Sorry, no bagged Sleepers/Onesies will be accepted. If you pair a sleeper with pants, it must be a long sleeved sleeper for the fall sale or a short sleeved one for the spring sale, and you can count this as an outfit instead of a onesies and it won't count against your onesie total. MATERNITY ITEMS must be in excellent condition and must be for Spring/Summer only. Please do not bring out-dated maternity clothes. They will not sell, therefore, we will not be able to accept them. Your maternity items need to be newer than 3 years. Styles have drastically changed over the last few years. Please secure the tops with safety pins if they have a tendency to fall off the hanger. Limit: 25 maternity clothing items per consignor. You can bring 25 to the first drop off times and add 25 more during the second drop off on Sunday evening. Each pair of shoes will go through a strict inspection. We will be very picky in our acceptance of shoes. Consignors will not place shoes on the floor. Volunteers will place shoes on the floor after drop off ends. We will accept Spring/Summer themed shoes in March and Fall/Winter in August. Consignors will take shoes to the shoe inspection table, in the center of the room, where volunteers will be looking for the following guidelines. Remember, they must look new. Brand new and like new shoes in sizes and styles that children wear. We accept up to a size 8 in girls and size 9 in boys. Most athletic cleats (specifically for soccer, football and baseball) that are clean with no dirt, and in good condition, even if they show a little wear. Dance, tap and ballet shoes. Shoes must be tied in pairs by shoelaces/ribbon/zip tie. Laces and shoes must be in excellent condition. Attach the shoe tag buy placing tape across the top of the tag and then hole punching a place where you could either tie the tag on with ribbon or with a zip tie. Please do not put the tag on the shoebox. Shoes are easily separated from the box. Small parts should be bagged and taped to the main part very securely. Use HEAVY packing tape. Others will not hold. If parts get separated, it will not sell. Several small items can be grouped together in Ziploc bags (books, rattles, grab bags or small toys). Please list all items on tag. Stuffed Animals: We will only accept name brand battery operated or motion Stuffed Animals. Games and Puzzles MUST have all pieces and be tied or taped closed. We get several email's each sale about items that were purchased without having all their pieces. BOOKS: If you're tagging books, try using painter's tape to attach your tags instead of the clear packing tape. It makes it easier to remove the tag without damaging the book(s). DVD and Music CD cases need to be double checked that their CD is actual in the case. We get several without the CD and it is such a disappointment to a shopper. We do not accept "R" rated DVD's. VCR tapes are no longer accepted. If you bring them to sell we will donate what you leave with us. New battery policy for items that are electronic-they must include their batteries or you will be charged a battery fee of $1 for each battery we have to place or replace. Small parts should be bagged and taped to the main part very securely. Use HEAVY packing tape. Others will not hold. If parts get separated, it will not sell. Secure Ziploc bags with packing tape so that pieces do not get lost. ELECTRONICS/VIDEO/COMPUTER/GAMES: Sorry, we are not able to accept "R" rated or "M" rated games. Please check every DVD case to make sure that the game is not scratched and that the game is actually in the case before you bring it to the sale. BAND/MUSICAL INSTRUMENTS must be in working order and in cases. All loose items belonging to instrument, sheet music etc must be in Ziploc bags taped up. Please place these items on the Electronics Table near the Hold Area. Your Electronics must include batteries and you must have cleaned out the battery box to be sure there is no corrosion. The items sell better if they customers are able to try them. Every once in a while, an item shows up without batteries or the batteries run down during the sale, and the shoppers bring this to our attention. If we are required to put batteries in your toy, we will need to charge a $1 per battery fee, which will be deducted from your check and you will have the battery tag describing the number of batteries we used. Car seats, strollers, high chairs, swings, exersaucers, bouncy seats, boppies, play gyms, pack 'n plays and bassinets sell really well! If equipment requires a battery, they must be included or we will access a $1 battery fee for each battery needed for a shopper to test your item. Kids furniture is always needed! Don't overlook your twin beds, cribs, toddler beds, chest of drawers, hope chests, book shelves, armoire, side tables, any wooden furniture sells well. NOTE: Your crib's tag will be attached to one of our Yellow Claim Tickets, so just bring your tag with you or attach it loosely so it makes it easy for us to place it on yellow claim tickets. For items with multiple separate pieces, put a tag on EACH piece. Fill out the first tag as normal, including the price, but include " 1 of X", where X is the number of pieces. On all of the other tags, type the same, the description only, no price or $0.00 on the rest of the tags, and type in description area "2 of X", "3 of X" etc. DO NOT write the price on any tag except the first! or mark out the price on the other tags. Only use multiple tags for separate pieces; do NOT use multiple tags for items that are attached together. Get your CAR SEAT CHECKLIST here. We are very strict on our acceptance of Car seats. They cannot be older than 5 years, have more than one owner or have a current recall that has not be corrected. In order to ensure that the car seats being sold at the sale meet high standards please be sure your car seat is clean with no stains and that you have filled out your car seat waiver to save you time and be sure it will be accepted before bringing it to the sale. We will inspect your car seats based on condition, we can not accept car seats that do not meet our standards or that do not meet the car seat check requirements. This includes infant car seats, convertible car seats, car booster seats and car seat bases. Due to recent recalls of drop side cribs, JBF can only accept the consignment of cribs manufactured on or after June 28, 2011. All cribs consigned with Just Between Friends must have a signed crib checklist from the consignor. Get your Crib Waiver here. Baby walkers that are consigned with Just Between Friends must meet the U.S. Consumer Product Safety Commission standard. Each walker must meet one of two requirements: 1) it must be too wide to fit through a standard doorway (at least 36 inches wide), or 2) it must have features, such as a gripping mechanism, to stop the walker at the edge of a step. The gripping mechanism will have rubber-like strips underneath or around the base to grip the floor and stop the walker at the edge of a step. Bath seats or bath rings that are consigned with Just Between Friends must meet the U.S. Consumer Product Safety Commission standard. Bath seats that do not meet the standard: 1) attach to the tub floor with suction cups and/or 2) were made before 2007 (see date code stamp on the bottom of the product.) Safety warnings must be printed somewhere on the bath seat product. Just Between Friends will not accept bath seats or bath rings that do not meet the safety standard. The CPSC considers bath seats that do not meet the standard to be a drowning hazard. NOTE: Your large toys and outdoor equipment Item's tags will be attached to one of our Yellow Claim Tickets, so just bring your tags with you or attach them loosely so it makes it easy for us to place it on yellow claim tickets. Large toys and outdoor play equipment must be clean, free of dirt and water. Mr. Clean magic erasers found at Walmart work well on these items. Must include all pieces. These include brand names such as Little Tikes, Step One, Todays Kids. Please use a piece of masking tape and put your consignor # and price in an inconspicuous place on the item. This will help us if the tag is misplaced. Mommy Mart is a section of our sale where you can sell your wooden furniture and a few other household Items. NOTE: Your large Mommy Mart Item's tags will be attached to one of our Yellow Claim Tickets, so just bring your tags with you or attach them loosely so it makes it easy for us to place it on yellow claim tickets. Needed Items: Desks, Chest of Drawers, Bedroom Furniture, porch furniture (wicker, rocker, porch swings), Book Shelves, Armoires, Dining Room Tables, End Tables, Sofa Tables, Coffee Tables, Chairs, Entertainment Centers, Bar Stools, Cupboards, China Cabinets, Buffets, Nightstands, Bureaus, Benches, Screens and Panels, Vanity Tables, Bunk Beds, Cribs, Changing Tables, Wooden Furniture of all kinds sell really well!. You must email a picture and price to daven@jbfsale.com to have your Mommy Mart item approved before you drop it off. Once you’ve checked in at the computer and put out your smaller items, you will want to drive your large household items to the back of the building and unload them there. Volunteers in the back will let you know where you can display your item. Bring your own muscle if you cannot lift your item by yourself. All items must be assembled by the consignor at Drop Off. To keep our reputation of "only the best", JBF asks that you be very selective about the quality of your furniture. All furniture must be intact and sturdy. Antique Furniture that is fragile and has an antique price, upholstered sofas and chairs or any kind without being cleaned and in a current style, lamps, figurines, dishes, pictures, ceiling fans, plants, mattress sets (except infant/toddler) and exercise equipment. Mom's Re-Gifting: We will have an area up front by the Hold Area for new and nearly new gift items that are specifically related to MOMS. This gives you a terrific chance to re-gift all those wonderful, thoughtful items that have never been used…like that third George Foreman Grill, a knife or stainless steel mixing bowl set, the Bath & Body Gift Pack in your least favorite fragrance or a no-longer-needed desk organizer. Please bring only "family-friendly" items that are new or like new! Dad's Depot returns - clean out your garage by reselling daddy's items too. Think man-cave and sports or hobbie themed items your husband would love! No time to Tag? We are now accepting items for our Fall/Winter Sale into our VIP Tagging program. These fill up fast! You can pay another successful JBF mom or experienced JBF staff member to tag your items for you. These ladies are successful consignors themselves, and will tag your items in a way that they are most likely to sell and earn you the most $$$. You pay them directly, JBF does not receive any of this money. Sign Up here for VIP Tagging Information on how it works and to get started today! If your name is not on the PC list and you think it should be, please email daven@jbfsale.com with your consignor number. Perfect Consignor status is a tangible way to THANK our consignors who consistently follow all the JBF guidelines. Browse this page to be sure you are following them to the T.
If you have no more than 3 stained/damaged/unacceptable items pulled while dropping off at inspection or during the entire sale (including shoes), Congrats - you've made our Perfect Consignor List. Don't be surprised if we choose you, but sometimes we do random quality control inspections of PC's items. Please, double check your items to make sure there are no stains. REMEMBER: Perfect Consignor status is earned each sale. Spend some extra time inspecting items at home so you earn the PERFECT status priviledge for the next sale! Check prepping info on each item category above to make sure your items will be accepted. 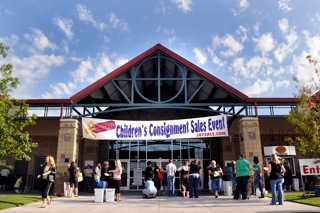 You must SIGN UP to consign online at least TWO weeks before each sale. Your THREE items or less rejected also includes shoes-so only place in the shoe baskets the shoes you know are in great shape. You must bring your own self addressed stamped envelope with you to drop off. FAILURE TO BRING A SELF-ADDRESSED STAMPED ENVELOPE WILL REMOVE YOU FROM THE PERFECT CONSIGNOR LIST FOR THE FOLLOWING SALE. SORRY NO EXCEPTIONS! You must make sure you have listed with us your correct email (we will communicate with you through this email). You must turn in your Inventory Sheet which we will have for you at drop off to our helper at Inspection Central. You must bring back your Pick Up Pass (last page of your waiver) if you are picking up your unsold items. FORGETTING YOUR PICKUP PASS AT PICKUP WILL REMOVE YOU FROM THE PERFECT CONSIGNOR LIST FOR THE FOLLOWING SALE. SORRY, NO EXCEPTIONS! Remember, if THREE or more of your items are found to be stained or damaged or you consign a recalled item or items missing pieces or parts, you will NOT be able to be a Perfect Consignor until you go back thru inspection for the following sale and try again. We appreciate our Perfect Consignors because they are rule followers, and help us run a very smooth sale! Thank you! ANY hanger works as long as they are the right SIZE: NB to 4T on 13 inch or smaller hangers & 5T to 14/16 on any adult sized hanger. If you need hangers we also sell them to make it easier on you. To set up time/place to meet for pick up. Checks made to JBF. To set up a place/time to meet for pick up. Checks made to JBF. Call/text Paul at 918-814-9326 with how many you need. JBF Tulsa asks consignors to use SAFETY PINS to secure their price tags; we do not encourage the use of tagging guns for this. -tagging guns can make holes in certain fabrics especially if you do not use the extra fine needles and barbs. Once your tagging gun puts a hole in your clothing, it cannot be sold...it is damaged and a shopper will be very upset when they get home and cut the tag off and find a hole that is now visible. -tagging gun price tags make it hard for breakdown volunteers who will be looking for the consignor number in other places than the upper right hand side of the clothing, and they slow down sorting. * you can get a safety pin around them when you need to attach two items to a hanger. Facebook Group for Consigning Help Consignor Checklist Perfect Consignor List Floor Map of Sale Early Drop Off Appt.